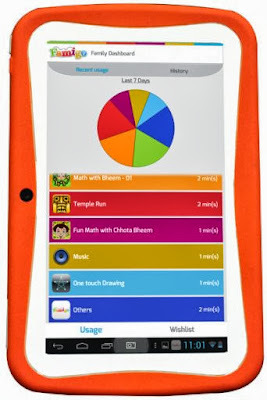 Swipe Telecom has launched its new tablet Swipe Junior, the tablet is specially made for kids. The tablet comes with 7-inch 5 point multi touch capacitive display with the resolution of 1024x600 pixels. It runs on Android 4.2 Jelly Bean operating system and powered by 1 GHz single core processor. 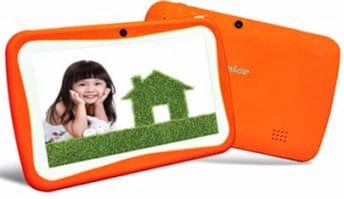 Swipe junior tablet has 512 MB of RAM, 4 GB of internal storage and external memory can be extended up to 32 GB using microSD card. It features 2 MP primary camera and also a 0.3 MP VGA front facing camera for video calls. It has the connectivity of Wi-Fi and 3G via USB dongle and it packed with 3000 mAh battery that provides 5 hours screen time. Swipe junior tablet made of food grade plastic material, so it will be safe from toodlers. And it comes with shock proof coating that protects from tumbling. The tablet also comes with kid oriented apps, games and ebooks. It has parental lock that lets parents to block unwanted sites and also restriction manager helps restrict particular apps with limited time. Swipe Junior Kids Tablet is specially designed for kids and school students and it is officially priced at Rs. 5990. It is available to buy on Swipe website and will be available on retail stores in India soon.